*phew* It’s been a crazy couple of days. My husband’s posting message came in. While we were hoping to get sent to Ottawa we instead were told we would be staying right here. Well ofcourse this opened up a flurry of “hey! We can settle and get our first home!” . Much searching later we found nothing on the market currently that fit our needs so we will let that idea sit for awhile. Besides, we are actually quite comfortable for now in our little military housing place. In all our haste we realized that some good bbq weather is happening out there. Where there is Q there must be potato salad! 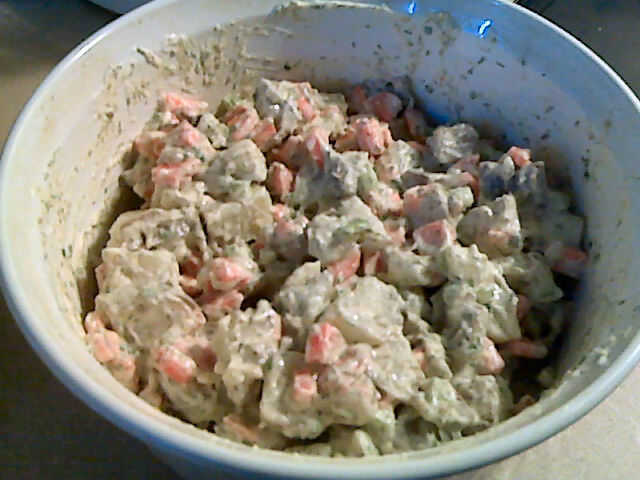 This potato salad is the only kind I’ve ever made. You see I had never made one before I met my husband, he requested it, I made one up. Apparently it isn’t typical but very yummy. Combine the mayo, dijon, dill, vinegar, and chives in a large bowl. There are two ways to do the potatoes. You can cut and boil them until fork tender or my preference which is to steam them with an extra tablespoon of dill so that the dill flavour is then infused into the potato. Cool the potatoes. Add cooled potatoes, carrots, and celery to the dressing. Salt and pepper to taste. You can serve it as is but I find letting it sit overnight makes it even better. I typically use 6 potatoes so this yields six servings. Each serving contains 211 calories, 7.5 grams of fat and 4.2 grams of fiber. A tasty side dish for any bbq, you can easily increase this recipe to feed a bunch of folks and they will never now it’s low fat….unless they read this blog ofcourse hehe. This entry was posted in Comfort Foods, Dinner, Lunch, Sidedish and tagged Potato. Bookmark the permalink. Delicious salad. Thanks for sharing! You are so welcome! It is a summer favourite around here.